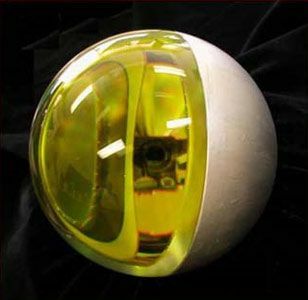 Spherical glass lens for laser geodesy, built by the NII for Precision Instruments (NIIPP), Moscow. Technology, geodesy satellite for NII Pretsizionnogo Priborostroeniya (NIIPP), Russia. Launched 2009. Status: Operational 2009. First Launch: 2009-09-17. Last Launch: 2009-09-17. Number: 1 . Gross mass: 7.00 kg (15.40 lb). Apogee: 822 km (510 mi). BLITS-M Technology, geodesy satellite for NII Pretsizionnogo Priborostroeniya (NIIPP), Russia. Family: Earth. Country: Russia. Launch Vehicles: R-7, Soyuz-2-1B. Launch Sites: Baikonur LC31. BLITS - . Mass: 7.00 kg (15.40 lb). Nation: Russia. Agency: RKA. Class: Earth. Type: Earth resources satellite. Spacecraft: BLITS. USAF Sat Cat: 35871 . COSPAR: 2009-049G. Apogee: 822 km (510 mi). Perigee: 818 km (508 mi). Inclination: 98.80 deg. Period: 101.30 min. Spherical glass lens for laser geodesy, built by the NII for Precision Instruments (NIIPP), Moscow..